If you are looking for soffit and fascia for your home in Grants, New Mexico, or a surrounding area, turn to the professionals at ABC Seamless of Albuquerque. Adding our products to your home will provide your roof edges with a classic look. All of our products are crafted on-site by highly qualified technicians allowing them to fit the precise measurements of your home for a beautiful appearance. Attractive appearance – By offering a variety of different colors we can guarantee that you’ll find one that will perfectly match the existing exterior of your home. Durability – All of our products are manufactured with 28-gauge, hot-dipped, G-90 galvanized steel, a stronger product than aluminum or vinyl. Our steel products can withstand severe weather conditions and will not develop cracks or leaks. 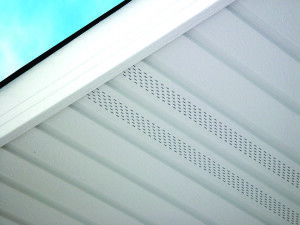 Superior strength – We screw soffit and fascia into place on your home instead of the more common method of stapling. This will allow for an unbeatable strength that will hold up to even the strongest winds. Additionally, at ABC Seamless of Albuquerque our customer service is among the best in the industry. All of our employees are factory-trained and -certified and will assist you with any questions you may have. Plus, all of our products are backed by a lifetime, transferrable warranty that covers labor and materials. For more information about the soffit and fascia products available to homeowners in Grants, NM, and the surrounding areas, contact ABC Seamless of Albuquerque today. Make sure to ask about our financing options available to all homeowners that qualify.